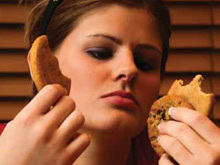 Binge eating is a disorder basically characterised by compulsive overeating. It is a condition where a person consumes huge amounts of food while feeling out of control and powerless to stop. According to the findings of a survey by researchers at Harvard University, binge eating is by far the most common eating disorder occurring in one in 35 adults. The typical symptoms usually begin in late adolescence or early adulthood, often after a major diet. A binge eating episode typically lasts around two hours, but some people binge on and off all day long. Binge eaters often eat even when they’re not hungry and continue eating long after they are full. They may also gorge themselves as fast as they can while barely registering what they are eating or tasting. People suffering from binge eating disorder struggle with feelings of guilt, disgust and depression. They worry about what the compulsive eating will do to their bodies, and beat themselves up for their lack of self-control. They desperately want to stop binge eating, but feel like they can’t. Binge eating leads to a wide variety of physical, emotional and social problems. People with binge eating disorder report more health issues, stress, insomnia and suicidal thoughts than other people. Depression, anxiety and substance abuse are common side effects as well. But the most prominent effect of binge eating disorder is weight gain. Manage stress: The most important aspect of controlling binge eating is to find alternate ways to handle stress and other overwhelming feelings, without using food.You could try exercising, meditating, using sensory relaxation strategies, and practising simple breathing exercises. Eat three meals a day and snack healthy:Eating a good breakfast jumpstarts your metabolism in the morning. It should be followed by a balanced lunch and dinner, and healthy snacks in between. Avoid temptation:Remove temptation by clearing your refrigerator and cupboards of your favourite sinful foods. Stop dieting: Instead of dieting, focus on eating in moderation. Find nutritious foods that you enjoy and eat only until you feel satisfied, not uncomfortably stuffed. Avoid banning certain foods, as this can make you crave for them even more. Exercise:Not only will exercise help you lose weight in a healthy way, but it also lifts moods, improves overall health and reduces stress. The natural mood-boosting effects of exercise can help put a stop to emotional eating. Fight boredom: Instead of snacking when you’re bored, distract yourself. Take a walk, call a friend, read, or take up a hobby such as painting or gardening. Get enough sleep:If you’re tired, you may want to keep eating in order to boost your energy. Take a nap or go to bed earlier instead. Listen to your body:If you ate recently and don’t have a rumbling stomach, you’re probably not really hungry. Give the craving time to pass. Keep a food diary:Write down what you eat, when, how much, and how you’re feeling when you eat. You may see patterns emerge that reveal the connection between your moods and binge eating. Get support:You’re more likely to succumb to binge eating triggers, if you lack a solid support network. Talking helps, even if it’s not with a professional. Lean on family and friends, join a support group, and if possible consult a therapist..
Dr Priyanka Rohtagi is Chief Clinical Nutritionist,Apollo Hospitals ,Bangalore.